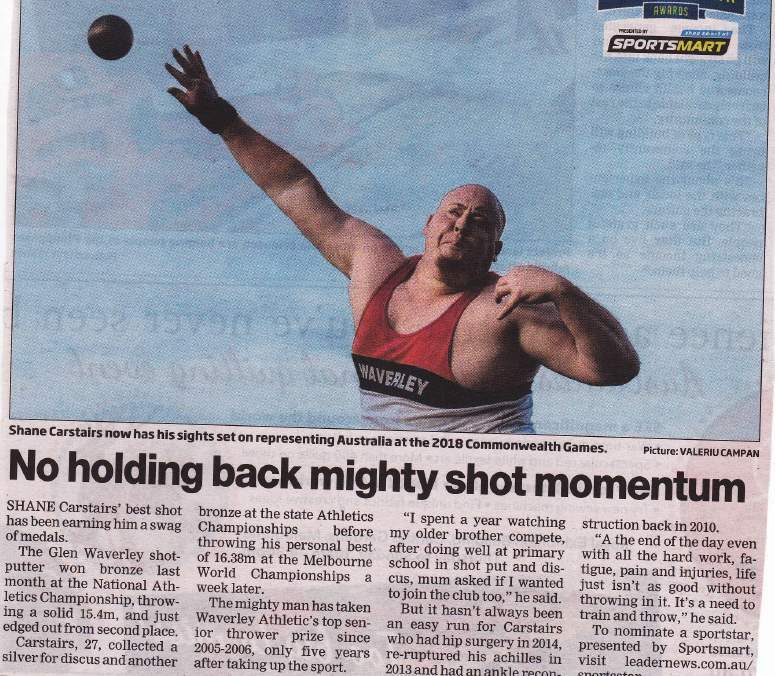 Congratulations to Shane Carstairs who achieved a bronze medal in the shot put (with a throw of 15.40m) at the 2016 Australian open track and field championships in Sydney. The new registration year commences 1 April. From that date registrations will be open at the Aths Vic website. Note that Athletics Victoria have changed the registration fees from last year. See our registrations page for further details. Errol Amerasekera M70 - Hammer 18.72m 3rd, Javelin 25.94m 3rd, Discus 25.08m 2nd, Shot put 7.68m 4th. Christine Bridle W55 - 100m 15.64 1st, 400m 76.44 1st, Long jump 3.69m 1st, High jump 1.20m 1st, Javelin 21.87m 2nd, Hammer 23.58m 1st, 60m 9.64m 1st, 200m 32.79 1st, Discus 17.47m 2nd, Triple jump 8.32m 1st, Shot put 8.42m 1st, Weight throw 9.81m 1st. Linda Buttigieg W50 - 100m 15.14 1st, Long jump 3.65m 1st, High jump 1.20m 1st, Javelin 23.97m 1st, Hammer 40.70m 1st, 60m 9.27 1st, Discus 24.45m 1st, Triple jump 8.03m 1st, Pole vault 2.90m 1st, Weight throw 12.16m 1st. Clyde Riddoch M60 - Weight throw 10.58m 1st, Pole vault 1.55m 2nd, 1500m walk 8.24.38 1st, Triple jump7.01m 1st, Shot put 7.70m 3rd, Discus 29.91m 3rd. Andrew Watts M60 - 400m 60.42 1st, 300m hurdles 51.66 2nd, 200m 26.93 1st, Discus 37.16 1st. James Atkinson M50 - 5000m 16.50.34 1st. Craig Sanford M45 - 400m 55.09 1st, 800m 2.09.01 1st. James McEniry M45 - 800m 2.11.99 2nd. 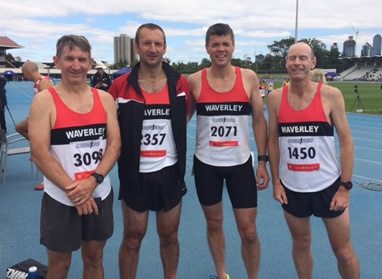 Congratulations to our men's 40 plus team which once again made it through to the AV Shield finals held at Albert Park. 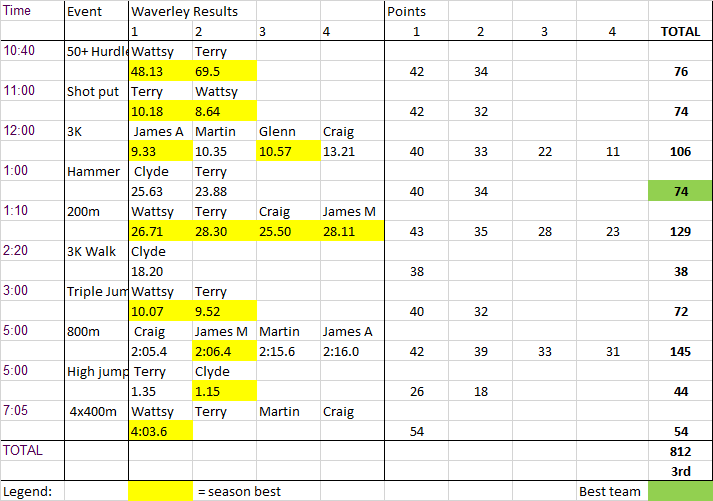 The 8 Waverley members were up against far larger teams but still managed a fantastic 3rd place. All of the athletes achieved at least 1 season best on the day, with a total of 14 season PB's by the team. Our women's 40 plus team, with only limited numbers, finished a gallant third in the white zone to miss out on the finals for the first time. 3 Dec 2015 (Thurs) - senior coaching 6.00 - 7.30pm. Central Reserve aths track. 6 Dec 2015 (Sun) - Northcote Gift: helpers needed. 10 Dec 2015 (Thurs evening) - Round 6 summer track and field: Nunawading (Bill Sewart Aths track, cnr Burwood Hwy & Newhaven Rd Burwood) from 6.00pm. Events include: 200m, 800m, 3000m, 1500m walk (juniors), 3000m walk (seniors), 4x200 replay, hammer, shot, high jump, triple jump. Welcome to new junior members: Cassie, Josh, Phoebe, Nathan, Lakdinu and Ross. Andrew Baxter has kindly volunteered to be the junior team manager. Registrations for the period 1 April 2015 - 31 March 2016 are currently open at: https://members.athsvic.org.au/login. It is not necessary to fill in a separate Athletics Waverley form - see registration page for club registration information and possible discounts and rebates.